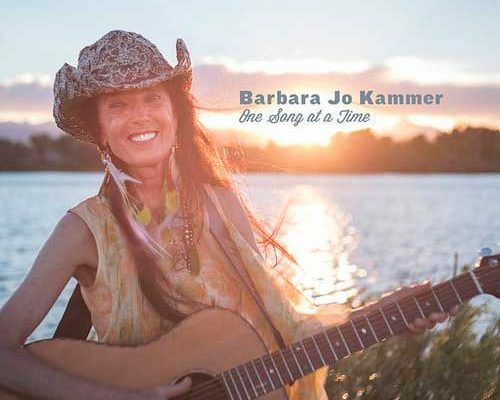 The ten songs on Barbara Jo Kammer’s solo debut One Song at a Time are deeply reflective of her personal journey and certainly seem to be chosen for cathartic as much as artistic reasons. There’s a nice array of instrumentation at play on this release and the production renders it all in warm, intimate detail. The album, naturally, focuses on Kammer’s voice and it’s a dramatically elastic instrument capable of exploring the many moods she calls upon during the course of this collection. There’s a consistent crew of supporting musicians helping Kammer realize her musical vision and the stability helps the release achieve an unity of sound that further deepens the impression it makes on listeners. One Song at a Time is, in some ways, a chronicle of Kammer’s recovery from the hell of active addiction, but it is also simply a testament to life’s eternal value and the music overflows with that life affirming vibe. That positive aura is palpable from the first. I Can See Clearly is a tune many are going to be familiar with and Kammer gives it a memorably vivid new coat of paint with a jumpy bluegrass arrangement. Her fellow musicians seize the opportunity to do something new with this venerable standard and turn in a robust outing. Kammer slows things down with Choices and it’s the first of a few examples on One Song at a Time of Kammer’s mastery of the classic country style. George Jones scored with this song a few years before his death and its easy to hear the cathartic appeal the lyric possesses for someone who has struggled with substance abuse, particularly alcoholism. Kammer approaches it head on and emerges from the other side as sounding stronger than ever. Hard Promises to Keep is the album’s sole duet, though Greg Blake appears again later on the album in a backing vocalist capacity, and the slowly evolving melody and chord progression provides an ideal platform for a classic country ballad. In a Cabin on the Mountain by the Pine, written by Robert Backlund, has strong verses handled by Kammer alone and a superb chorus where she’s joined by other voices to memorable effect. Jake Simpson’s fiddle playing is a musical highlight while Andy Dunnigan’s dobro flash colors in the song just enough. Medicine Wheel has a slightly darker musical air, but it’s no reflection of despair. The mood, instead, aims at conveying the seriousness of its subject matter and the pedal steel contributions from Charlie Rose enhances its inherent beauty. Her one original track on the album, The Winning Side, is a rousing testimony of gratitude for a new way of life that never comes off as fake or exaggerated. Mule Skinner Blues, a revisiting of a Jimmie Rodgers classic, finds Kammer reaching back to the beginning of modern country music for a final pulse-racing performance with an especially inspired Kammer vocal. One Song at a Time is a rewarding release for both performer and audience – these are performances possessing real depth and substance. If you enjoyed a sneak preview from One Song at a Time, check out the official website for Barbara Jo Kammer by clicking here. Give her a like on Facebook by clicking here & a follow on Twitter by clicking here.